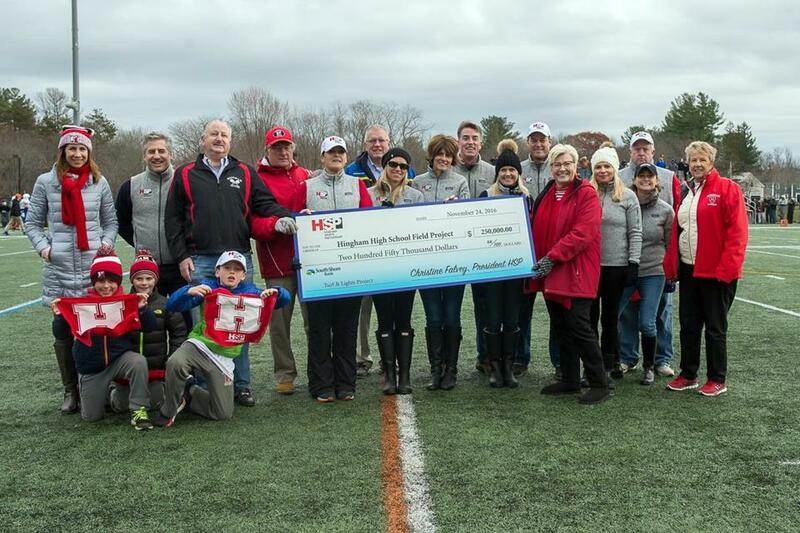 Members of the Hingham Sports Partnership were recognized for their fund-raising efforts during halftime of the 2016 Thanksgiving football game. The Hingham Sports Partnership was recognized at halftime of the Thanksgiving Day football game between Hingham and Scituate for helping to raise $1 million for the high school athletic complex. Margaret Conaty, director of athletics at Hingham High, said in a statement that the work on the outdoor facilities transformed them from muddy, overused fields with deteriorated track and tennis courts, to a state-of-the-art athletic complex. “The completed project allows our students and community to attend night games and has increased fan attendance dramatically,” she said. The partnership initially paid $125,000 in 2013, with a commitment to pay $25,000 annually for five years. It is paying off the debt to the town one year early. The partnership was founded in 1995 by a small group of Hingham parents and is now an independent nonprofit that has raised more than $2 million in grants for athletics needs and scholarships, according to the organization. Jean Lang can be reached at jeanmcmillanlang@gmail.com.